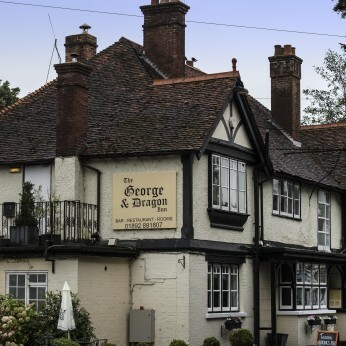 In the beautiful Kent countryside, the historic village of Lamberhurst is home to the George & Dragon Inn situated at the base of School Hill adjacent to the River Teise. As you desend the tree lined old A21 and take in the vista of the beautiful Kent countryside, the historic village of Lamberhurst lays before you. You can not fail to notice the George & Dragon Inn situated proudly to the left at the base of School Hill. The building dates back prior to the census of 1851 when Thomas Watkins resided here as publican and employed John Jeffery as ostler. The George, as the locals call it, is now a pub & restaurant with bed & breakfast accomodation. A sun trap riverside terrace alongside the Teise is a great place to relax and sample our vast wine cellar, champers & prosecco all by the glass, local ales or one of our premium beers and gins. Tuck into our freshly prepared seasonal menu of rustic English pub classics or daily specials. All functions and events catered for. Are you a solo artist, duo or band in need of rehersal space? Give us a call, space available on Monday, Tuesday or Wednesday day or night. Do you play in a band, duo or solo? We are looking for quality musicians to compliment our weekly entertainment nights. Pop in or give us a call on 01892 891807.